Audi's latest plug-in hybrid handles like it's on rails, and pulls like a freight train. That's because it's a train, and literally rides on rails. The vehicle in question is a locomotive which the German automaker developed for its main factory in Ingolstadt incorporates over 11 miles of railroad tracks, along which are transported parts and completed vehicles to be moved around the site. To carry out those duties, Audi teamed up with French manufacturer Alston to deploy a new hybrid locomotive on premises. The locomotive features a plug-in hybrid propulsion systems capable of running on electric power alone for two hours at a time, and can be plugged in to recharge during down-time. The upshot is that it not only pollutes less overall, but can be run inside warehouses more safely. When the power runs out, the electrical system is backed up by a diesel engine. Audi reports that 15 trains arrive at the factory every day. It employs 17 locomotive drivers on site. And each locomotive runs for 3,800 hours each year. 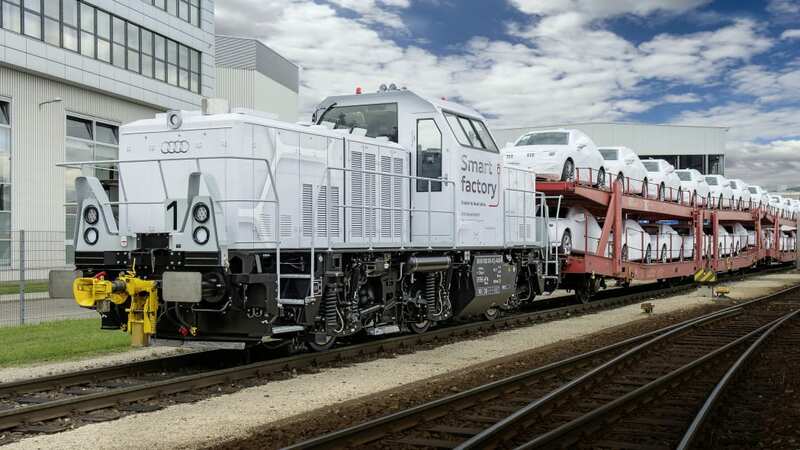 Whether we can take Audi at its word when it comes to diesel emissions or not, the company claims that the new hybrid locomotive cuts its carbon emissions by half, taking 60 tons of CO2 out of the atmosphere each year. 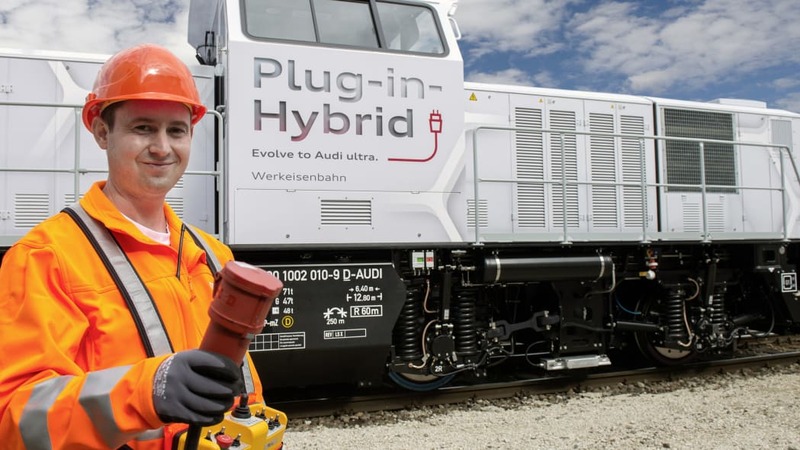 This Audi drives on rails: A 1,000 horsepower plug in hybrid locomotive manufactured by Alstom replaces the plant locomotives previously used at the Audi plant in Ingolstadt as of today. This means that components and finished Audi models will now reach the plant's loading stations in a more climate friendly way. "Our goal is all‑round sustainable logistics," stated Johann Schmid, head of the Audi plant railway in Ingolstadt. "The new railway technology allows more economical, energy‑efficient and low‑emission rail transport. 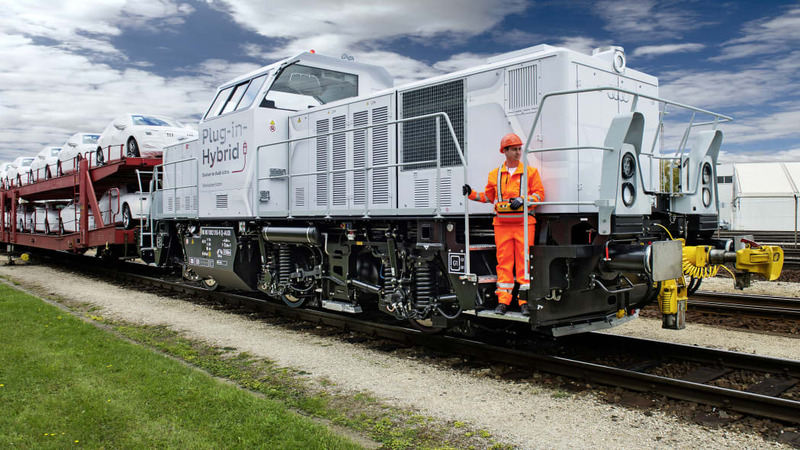 In connection with the latest chassis technology, the plug‑in‑hybrid locomotive sets new standards in shunting and rail transport." The complete automobile plant in Ingolstadt includes 18 kilometers of railways. Every day, 15 goods trains arrive at Ingolstadt North railway station for Audi – loaded with pressed parts, engines and transmissions, as well as cars from other Audi sites that are ready for delivery to customers. And cars produced in Ingolstadt also start their journey to customers by rail. 17 Audi locomotive drivers work at the plant railway. One of their tasks is to allocate the wagons to the various plant buildings. One plant locomotive carries out up to 75 shunting maneuvers every day and operates for an average of 3,800 hours each year. The new locomotive runs without any emissions inside the plant buildings and can operate for up to two hours at a time in purely electric mode. Its battery is plugged in during breaks for recharging with CO2‑free electricity, or is supported while in motion by a diesel engine. Hybrid locomotives are significantly quieter and their CO2 emissions are reduced by half compared with conventional locomotives at the plant. This means that the plug‑in‑hybrid locomotive emits up to 60 tons less CO2 each year. For the Ingolstadt plant, this is another stage on the way to the CO2‑neutral factory.